Great presentation with audio. This slidecast is a brief summary of many B2B Social Media lead generation presentations from Kipp Bodnar. The slides are copy light as that is his presentation style. Take Facebook Fan Pages to the next level with custom offers and lead generation opportunities. 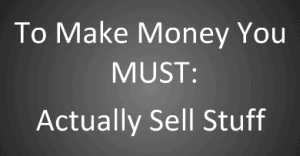 And remember you really have to sell stuff to make money! Hi Priit, thanks for sharing this excellent presentation. Those of us in B2B struggle to find ways to use social media even though we see a huge potential for it. This presentation confirms a lot of my thinking as for small B2B co that has a very industrial product, no brand, sales frequency is less, and customers who generally do not reside in social media such as FB. Even with this kind of business, there is place for social media tools as has been so well presented in this presentation. Thanks again for sharing.